Start Getting Your Mind Right- and Embrace Your Happiness! 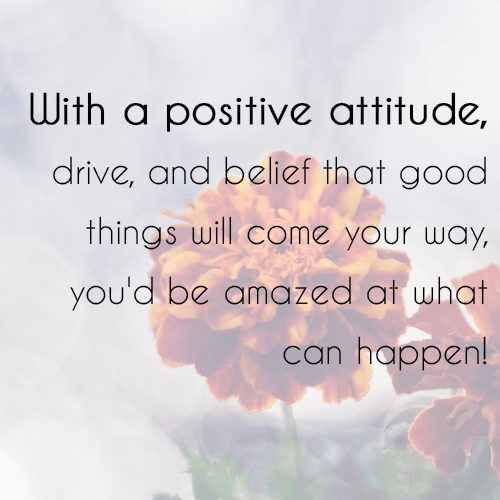 I’ve always been a believer of the power of positivity and just positive thinking in general. That’s not to say that I never have a negative thought, or have even had phases in my life where I dwelled more in that negative head space than I would have liked. But, in general, I feel that living your life with a conscious realization of your mental headspace, policing your thoughts, and cultivating a positive mindset is something that is critical for ultimate happiness in my opinion. We’re told millions of ways to “get our body right.” How to “tone up.” How to perfectly prep Instagram-worthy meals. And there is just so much focus on our bodies, our appearance, and how others perceive us. But we really need to “get our mind right,” first. In order to truly succeed and seek happiness in life, it’s so, so important to conquer what’s going on mental y and try to cultivate an abundance mindset. So…What is an Abundance Mindset? It’s a belief that there is plenty of positive and goodness to go around. That you’re meant for great things, no matter the current situation you’re in. Even if things aren’t great at the current moment- it’s living your life with the feeling that something great is just around the corner. That someone else’s success is not equal to your failure. What’s the opposite of an abundance mindset? A scarcity mindset. Feeling like you’re not good enough. That you’ll never have enough money, enough time, enough love. That someone else’s success means that you’ve failed. That everyone is out to get you. That people actively look for reasons to hate you and you’ll never amount to anything. It’s that little nagging voice that brings you down…if you let it. I don’t have to tell you which one makes for a happier existence. And I’ve definitely been there. It wasn’t pretty. One of the best teachers of positive thinking in my life was my dad. While he never spoke explicitly about an abundance or a scarcity mindset, it was absolutely videnced by his life. When I was 15, he was diagnosed with an aggressive form of Leukemia, out of the blue. I spent most of my freshman year in high school in the hospital every afternoon, spending time with him. We’d laugh, reminisce, and talk about the things we would do when he would defeat the horrible disease and get out of the hospital for good. Throughout all of this, the one thing I will always remember was his attitude. He had an unwavering positivity and strength about him that never faltered. Not even when things looked grim. Not at any moment. He always talked about healing, and was very strong in his faith, constantly reading the Bible and writing down verses and positive mantras that spoke to him. He smiled a lot. He was in remission for a while, and we were positive that this was the end of this horrible disease, once and for all! But unfortunately, after the leukemia came back unexpectedly, he died 3 days later. But his legacy and his positive spirit didn’t. It’s always with me. He was one of the most inspiring person I’ve ever known. I miss him all the time, but I know he would want me to live a positive, fulfilled life, pursuing the things that bring me joy because I know that would have made him happy. I knew I couldn’t let his passing define who I was or who I was going to be. I allowed myself to grieve but I didn’t allow it to overcome me, because I just didn’t accept it as an option. But we can control how we react to what happens to us. You have 2 choices. “Fall into the pit,” or climb yourself out step by step. I don’t care what situation you are in, there is always a way to get out and to soldier through. There is always a way to find the silver lining. At the very least, have hope. A belief that things WILL get better- because if you believe it- they will! I truly believe that. Now I’m not saying that you have to *only* believe things for good things to happen to you, and not put any effort in! Not at all. In fact- most of the time, it’s a lot of freakin’ work. It takes a lot of tears and sweat and failed jobs, business ventures, and relationships before you get to that good place sometimes, but my philosophy is this: Even if it’s not by much, if I am always moving forward in some way, then I am making progress. I am making my way towards where I want to be. Also- you have to think long term. Understand that you’re not going to solve every single one of your life’s problems in a day. Or a month. or 6 months. But give yourself a year, maybe- with a positive attitude, drive, and belief that things will come your way, you’d be amazed at what can happen! One major aspect of a positive mindset and in attracting good things into your life stems from practicing gratitude. Gratitude is such an essential component of being happy and getting to that next step in your life. Because if you can’t appreciate what you currently have- how can you expect better things to come along? They just won’t! Do you ever start falling into negative thought cycles where you feel like you will never get out of a bad situation? Here is something practical you can do- you can just do it in your head or physically write it out. List 10 things you are grateful for, right now. This list can include anything and everything.It’s an important exercise because we take so many things for granted. Are you healthy? Are you able to walk? Do you have shelter? Do you have access to clean water? Are you able to be well-fed? Do you have a family that cares about you? Do you have a good friend who is always there for you in hard times? Are you able to provide for yourself? Are you able to see? Are you able to live in a war-free zone? See? It’s not that hard to find things to be grateful for! I promise if you do this every day, maybe right before you go to sleep, in your head- you’d be amazed at how much more at peace you will feel. It’s just a little step towards a happier life. And sometimes that’s all it takes to get the ball rolling! It’s Okay Not to Be a Barbie.